Within the app, by opening a conversation. Within a conversation's notification, when you receive a new message. This was made possible by leveraging Google's new ML Kit functionality. Pulse will suggest relevant Smart Replies, within a conversation. If the app finds suggestions, they will appear directly above the area that you type your messages. Not all conversations will display Smart Replies as they change with each conversation and take that conversation's context into account. Not into the suggestions? You can hit the "x" button on their left side to dismiss them. You can also head to the Advanced Features section of the app, if you would rather disable the Smart Reply suggestions. You can also set up Smart Replies to be shown in your notifications. To have a notification suggest a Smart Reply, head to the Notification Actions preference. 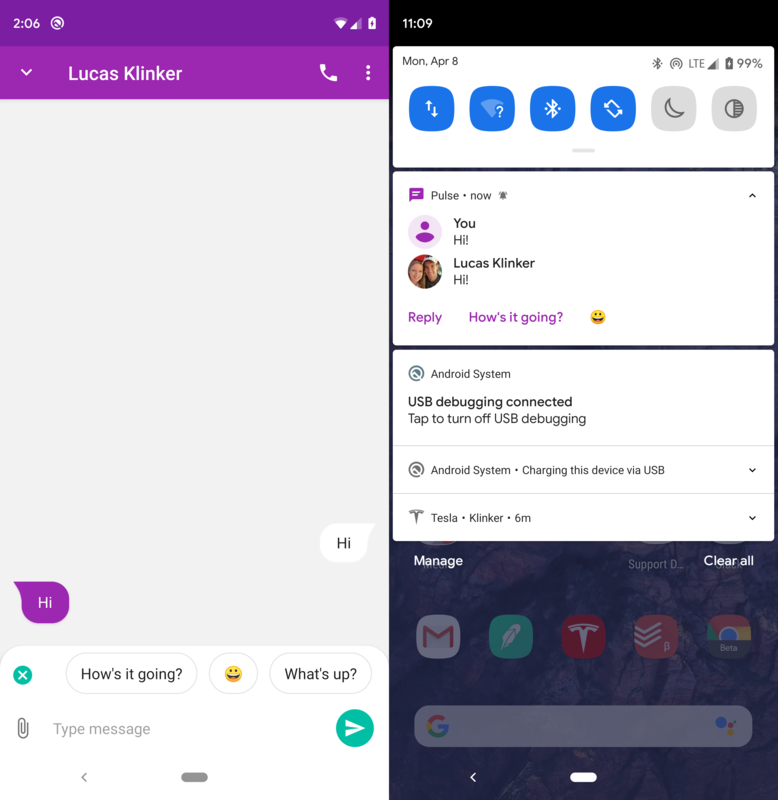 This menu gives you fine-grained control over which buttons you want to appear on your notification and turn some of those buttons into Smart Replies. You can set up to three notification actions, all of which could be smart replies, if you choose. Pulse has always put privacy first with it's cloud messaging. With our web app, everything is end-to-end encrypted before it is uploaded, and no one can decrypt those messages without your personal password. We wanted to make sure that our Smart Reply implementation didn't compromise this privacy! Smart Replies are generated directly on the device and are not computed on any remote server. They never leave your device and are not used outside of that local device, in any way. This functionality will hopefully begin rolling out to production users of the app, within the next week! (Pending show-stopping bugs 🤞).